The iPhone doesn't come with a printed user guide, but that doesn't mean that there isn't a guide. You just need to know where to look for it. All iPhone models are relatively similar when it comes to their hardware. It's the software that's really different. Apple releases a user guide that covers all models that can run the latest operating system every time there's a major new version of the iOS (the operating system that runs on the iPhone). Apple produces other instructional materials—such as Product and Safety Info, and QuickStart user guides—for each model. Identify which model you have below and then download the user guide you need. If you are interested in learning about iOS 11 and whether or not your device is compatible with it, we've got an iOS 11 compatibility guide for you. This extensive iPhone user guide includes full instructions for how to use your iPhone. If you're looking for a traditional manual, this is it. As mentioned earlier, Apple produces a new version for every major iOS release. All available editions of the user guide, in all formats, are linked to from here. Like with other recent models, Apple hasn't put much traditional user guide information into the download available for the iPhone X. 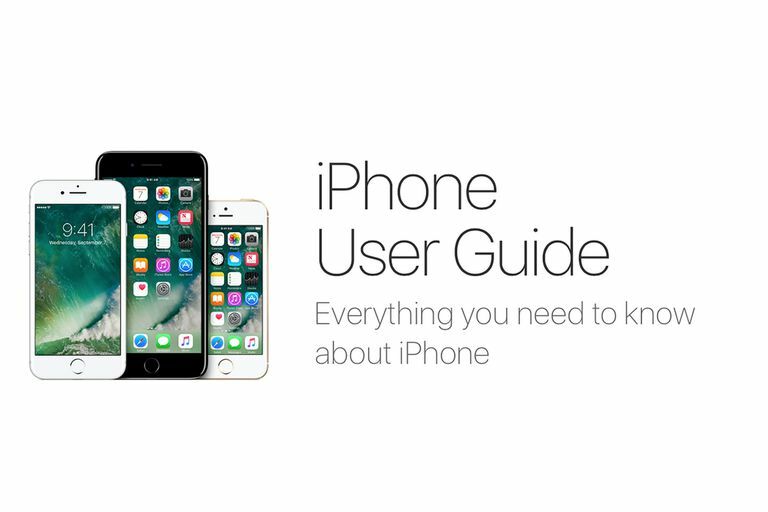 Check out the user guides just above, starting with the latest version of the iOS, to get full details on how to use the iPhone. The iPhone 8 with Apple's AirPower wireless charging mat. The documentation for the iPhone 7 Plus and 8 Plus are combined (just like with the 6 Plus and 6S plus). You won't find much, just some basic safety and warranty details. If you want a more-traditional manual, check out the user guides in the first section of this article. Just like with the iPhone 6 and 6S, the documentation for the iPhone 7 and 8 is combined into a single PDF with basic safety information in it. There's also that information for the wireless AirPod earbuds, as well as a quick start for the AirPods. You'll find the most detailed, extensive information in the iOS 11 user guide linked to in the previous section. The iPhone SE looks a lot like the iPhone 5S, but it's stamped with the letters "SE" on the back beneath the iPhone name. That's probably the easiest way to tell whether you've got an SE or a 5S. The iPhone 6S and 6S Plus. Like their larger siblings, the iPhone 6 and 6S are grouped together in a single document. And, just like those models, the information is almost strictly legal and not designed to help you learn how to use the iPhone. iPhone 5. image copyright Apple Inc.
You'll know the iPhone 5S as the first iPhone with the Touch ID fingerprint scanner. The available documentation for it is the same kind of basic legal information as for the 6 and 6S series models. The iPhone 5C can be identified by the brightly colored plastic housing used on its back. It's the same size as the iPhone 5—in fact, except for the housing, it's almost the exact same phone. Like the 5S and 6 series, its download is just legal content. The iPhone 5 was the first iPhone with a screen larger than the 3.5 inches the original models sported. This one has a 4-inch screen. At the same time the phone debuted, Apple introduced its new EarPods, replacing the old earbuds that came with the earlier iPhones. Documents here include some quick tips for using the iPhone 5 and instructions for using the EarPods. The iPhone 4S introduced Siri to the world. When this model debuted, it was the only way to get Apple's personal assistant. The downloads here include quick tips for using the phone as well as basic legal info. The iPhone 4 became famous—or, more rightly, infamous—for the "death grip" problem with its antenna. You probably won't find mention of that in either of these downloads. That's OK, just putting a case on your phone solves it. This model introduced the iPhone's naming pattern to the world. That is, the first model of a new generation is just a number, the second model has an "S" added. In this case, the "S" stood for speed; the 3GS offered a faster processor and faster cellular data, among other things. The iPhone 3G's core improvement was support for 3G wireless networks, something the original model lacked. The PDFs here provide legal info and some basic operating tips.